Rafael Martínez-Oña, Maríadel Carmen Pérez.Tecnatom, S.A.
Non-destructive examination (NDE) plays an essential role on maintenance programmes to assure operation of industrial plants. Life of radiant catalyst tubes of reformer units exposed to high pressure and temperature is limited by creep damage. Present inspection techniques offer unreliable results, removing tubes from service in a very conservative manner or occurring unexpected tube ruptures. Existing ultrasonic methods rely on the analysis of ultrasonic amplitude of the received signal. Due to the material coarse structure, this produces qualitative assessment as well as, in occasions, unreliable results. To overcome these limitations a multi-interrogation ultrasonic technique and correlation of several parameters such as attenuation, energy and tube diameter with material features is devised. This paper describes the principles of the ultrasonic method for creep damage detection as well as details of the inspection system. After that, results of measurements performed on representative damaged specimens are also shown, including relationships between ultrasonic and metallurgical parameters. The optimisation of the costs of industrial plants maintenance by preventing non-scheduled outages or extending service lifetime are increasingly important. Reformer units are critical to many processes in refining and chemical plants. Life management is ordinarily dominated by the service capability of the radiant catalyst tubes. Their lives are limited by creep, driven by a combination of internal pressure stress and through-wall thermal stresses generated by operational transients. Although the service life may be estimated making use of theoretical models, due to the degradation process complexity, still it is necessary to characterise the materials of concern by NDE methods. Elastic and inelastic properties of a solid medium affect the propagation of ultrasonic waves crossing through it . Therefore ultrasonic waves may provide information about the material insonified. Mainly, ultrasonic methods are based on the measurements of ultrasonic wave attenuation and velocity. Then, the objective is to find out and characterise some relationships between the state of the material and the ultrasonic parameters. This paper describes an ultrasonic technique for detecting creep damage in reformer tubes. It follows the application of this method to specimens with actual creep damage and finally presents important features of the inspection system, devoted to the ultrasonic examination and the measurement of tube diameters. For the purpose of NDE methods, creep damage first develops voids, coalesced voids, and then micro cracks and macro cracks, which may evolve to rupture, accelerated by service conditions. Detection of creep damage in its first stages by NDE is a difficult task due to the coarse structure of the centrifugal cast austenitic tube material and the subtle changes produced by voids. Ultrasonic parameters are dependent on the characteristics of the ultrasonic pulse emitted and the properties and state of the medium through it passes. If the relationships between ultrasonic parameters and material are known, it will be possible to determine the state of the material by measuring the ultrasonic variables. When the material exhibits creep damage, due to the presence of cavities, the attenuation changes from its standard value; studying these changes the damage can be characterised. Figure 1 shows some stages in creep damage, from an undamaged material (on the left) to a failed tube were voids coalesce producing microcracks (on the right). 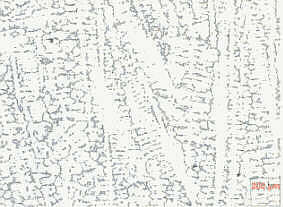 Fig 1: Micrographs from undamaged material (left) and from material belonging to a tube that has failed (right). 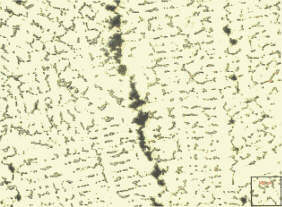 Aligned voids produced microcracks. Damage normally starts at the centre of the tube thickness and, due to operating temperature and pressure, develops to the inside surface. Therefore, a volumetric method such as ultrasonic is required to detect voids. On the other hand, high anisotropy of the centrifugal cast austenitic material produces high attenuation and scattering. However a judicious selection of ultrasonic variables could minimise these effects and be able to detect creep damage. The method consists on a pair of probes arranged in pitch and catch fixture. The transmitter sends a pulse, which travels following a chord in the tube and is picked up by the receiver (see figure 2, (a)). The fixture is designed to allow the central beam passes by the mid-wall chord. Then, the wave signal received and the associated energy are affected by the insonified material structure. Presence of cavities will produce some attenuation and scattering of the ultrasonic wave, these will increase or decrease depending on the number and extent of cavities. Therefore amplitude, and then energy, of the received signals is a rough indicator of the present damage. High attenuation is associated to high level of damage and low attenuation to low level of damage. Due to the surface state of reformer tubes, non-contact techniques must be applied. Since no water spilling (or any other liquid) is allowed into the furnace, the design is based in a local immersion technique, using compression wave probes. When the UT beam go through the water and cross the steel, the probe angle is diffracted (see figure 2, (b)). Even, mode conversion is produced (unless in the case of normal incidence), generating shear and longitudinal waves. The shear wavefront has some limitations to be transmitted in this type of materials. So, it has been shown that the best probe arrangement (based on the distance between emitter and receiver probes and in the tilt angle) consists of doing the longitudinal wave cross the tubes along the middle thickness. Amplitude of the ultrasonic signal is the first information to be evaluated in order to identify damaged areas. Due to the coarse structure of the tube material, there might occur changes in the ultrasonic response from point to point, which could mask the damage detection. Then, to assess the tube material, it is studied the evolution of signal amplitude in different adjacent locations along the tube (figure 3). Two arbitrary samples (HP-micro material), with a service life of approximately 14 years, have been selected to illustrate the ultrasonic behaviour and capabilities to detect creep damage. In order to perform a more reliable assessment, in addition to analyse tube diameter increment due to creep relaxation, other ultrasonic variables are considered. Knowing the damaged material behaves like a low pass filter dispersive medium, frequency analysis of the ultrasonic response provides valuable information of the energy band distribution. In other words, the evolution of energy bands of received signals (figure 4) and the amplitude responses of probes of different frequencies are studied. A set of samples retired from service has been selected to test the ultrasonic technique and to correlate the UT behaviour with the metallographic characterisation. Table I summarises their main characteristics. Once the testpieces have been metallographically analysed, they have been inspected in the laboratory by ultrasounds. Figure 5 shows how the amplitude of the UT signal (in sample 2) is lower when damage increases (in comparison with sample 1). This effect is clear in the bottom of the tube (that corresponds with the left hand of the C-scan). Although the length of the testpieces for lab trials is reduced (up to 300 mm) comparing with the total length of the tube (10-15 m.), a global analysis establishes differences between both samples. The C-scan represents in X-axis the length of the tube and in Y-axis the position around the tube circumference. It is very important to notice that the inspection device for laboratory trials presents some problems to maintain the probes arrangement in the borders of the tube. These problems are solved in the in-service inspection device, because, in this case, the probe holder embraces the tube, keeps this position and adapts its configuration to the tube deformations. From the metallographic point of view, the state of the material is classified in several stages, in order to correlate with the ultrasonic response. Table II reproduces a possible classification method based on the presence of carbides, voids and cracks, from level 1 (undamaged material) to level 6 (highly damaged material). To allow implementation of the ultrasonic method for in-service inspection, the ultrasonic probe holder is mounted on a mechanical scanner, which moves vertically up & down along the tube generatrices [3-4]. Up to four probe holders can be installed in the device, which makes possible to examine the four corresponding axial zones. Increment of tube diameter is an indicator of creep relaxation presence. Then, as the scanner is inspecting and moving vertically, two perpendicular tube diameters are measured along the tube. The scanner has two pairs of clamps, which allow to fix it around the tube and, properly synchronised, move it vertically. The principle of diameter measurement is based on the measurement of the opening/closing of each pair of clamps around the tube. An accurate displacement gauge is associated to the clamp opening from which the reading is taken. The accuracy of the diameter gauge measurement is better than 0.1%. The inspection is performed automatically as well as the data acquisition of both ultrasonic and diameter measurements making use of Midas data acquisition and analysis system [5-6], which shows up acquired signals in real time. 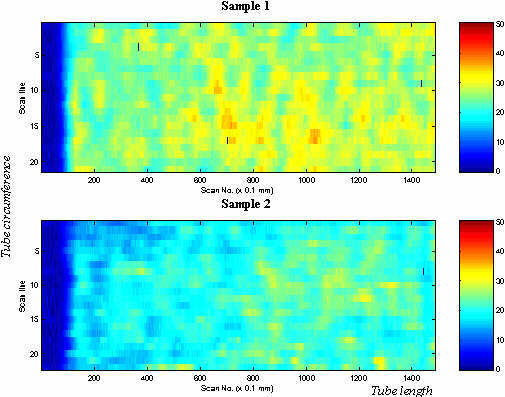 Subsequent processing computes C-scan maps (figure 5) for displaying the variables of interest either ultrasonic amplitude, energy or tube diameter along the tube surface inspected. Additionally, to perform a more comprehensive assessment, NDE inspection results are correlated with calculated strain, damage and degradation levels. Detection of creep damage in reformer tubes is a difficult task due to the anisotropic structure of these materials. In this paper, an inspection method based on the measurement of several ultrasonic parameters and tube diameter has been described. Characterisation of ultrasonic attenuation and energy band and tube diameter allows determining the presence and level of creep damage in reformer tubes. Most of this work has been realised in the framework of European Commission BE-5126 project. Authors are thankful to Mr Gilles Verdier of Manoir for providing the specimens and their metallurgical characterisation, and to the other project partners for their support. Metals Handbook, Vol 11. Non-destructive inspection and quality control. 8th Edition. American Society for Metals (1976). Metals Park, Ohio 44073. E. Schreiber, O. Anderson, H. Soga, "Elastic constants and their measurements", McGraw Hill, New York, 1973. A. Scheerder, "Experiences at DSM with NDT and Evaluation of Creep Damages in Reformer Tubes". 7th ECNDT. Copenhagen, 1998. R.R. Dalton, "Ultrasonic inspection of cast HK-40 tubes for creep fissures". Standard Oil Company of California, Richmond, California. Materials Evaluation, 1976. M. Borrás, E. Cabrera, J. Aldea, "Multitechnique data acquisition systems. Use and benefits in nuclear market". 7th ECNDT. Copenhagen, 1998. R. Martínez-Oña, "Enhanced ISI of austenitic materials: experience and equipment. IAEA Regional Workshop on environmentally assisted cracking of NPP austenitic piping". Slavutych, 1998.